I was always unhappy with the way we deploy our applications and in every new project we setup the exact same stuff over and over again. The wish for simplicity was growing strong. Just that day starring at the empty mailbox an email popped up. I totally forgot that I signed up for it but having read about Bitbucket Pipelines beforehand I wanted to try it out immediately. React Application build with npm. 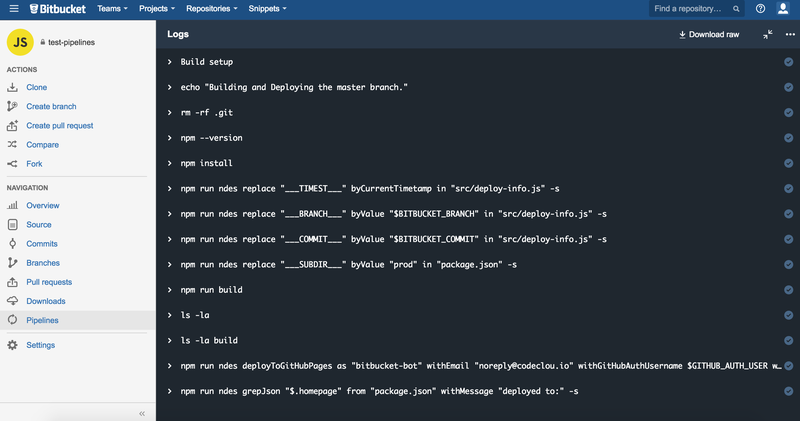 Build and Deploy feature branches to subdirectories on GitHub Pages. Create some build-info file containing Git-Branchname, Git-Commit-Hash and Build-Timestamp displayed in React Application footer. That sounds quite complex and usually I have some ugly bash scripts and use Jenkins to get the job done (which is also nice but does not follow the simplicity-paradigm). While looking for a simple buildchain for React I stumbled upon a recent React BlogPost about Create Apps with No Configuration. This looked really nice and provided ES6 and webpack out of the box therefore we will use that build-chain for our example. Now put that created project inside a Bitbucket Git Repository. Since we want to display the Git-Branchname, Git-Commit-Hash and Build-Timestamp in the React Application footer we will create some files. And you should see the messages in the footer. Note that we put in a placeholder called __SUBDIR__ which we will replace later during the build with an actual value. 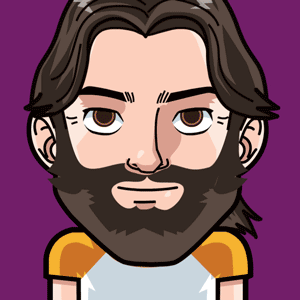 You can clone the final example from GitHub. You have configured your React Application and pushed it to your remote Git Repository on Bitbuckt as described in the previous chapter. If you haven’t done so you can start by cloning a preconfigured Repository. Once you joined the Bitbucket Pipelines Beta you will have a new menue item in the sidebar called Pipelines. Before you will see that you will need to create a bitbucket-pipelines.yml file in the root of your previous created Bitbucket Git pipelines-test repository. Basically you first define a Docker image which is in our case node:5.11.0 and then you define build steps and scripts. Once you push to your repository now the pipeline kicks in and will create a docker container, clone your repo and perform the build steps you defined. Ok now we have just built our Application but we want to deploy it and replace the placeholders we created in thepackage.json and src/deploy-info.js files. As you might have seen the bitbucket-pipelines.yml file looks now really clean and we do not want to bloat it with shell commands or call external ugly shell commands… That’s why I created the node-deploy-essentials project so that we can write human readable and nicely looking deploy commands. Alright, now we can use some neat commands and improve our bitbucket-pipelines.yml to deploy our built React Application. Since we want to clone a GitHub Repository we need to define username, password and the cloneUrl somewhere. And we don’t want to put that in our Code. Therefore create the following Pipeline Environment Variables on theRepository Settings - Envrionment variables Page. Ok know you might just have fallen off your chair but let me explain it step by step. First of all we have configured two different build steps based on branchnames as described in the Bitbucket Pipelines doc. Branches called feature-… for example feature-buttonRed are built and deployed differently than themaster branch. just prints out the version on npm. installs the dependencies of our test-pipelines React Application. like before the node-deploy-essentials replace command replaces by $BITBUCKET_BRANCH which contains the current branchname of test-pipelines provided by Bitbucket Pipelines as Environment Variable. is replaced by the actual commit hash provided as ENV-Variable . As you build locally this builds the React Application and creates the ./build/ folder containing index.html and bundled js and css files as well as all other assets. Since we cannot look into the docker container we use this command to list all files in the root directory of the project. This lists all files inside the ./build/ directory. If you want to actually see a files content just use cat build/index.html as script. First of all - yes it is a very long line but Bitbucket Pipelines is limited to single line commands for now and once you read it step by step it isn’t that long. Basically it defines all parameters necessary to clone the Repository containing the gh-pages branch. It will clone it, move our files inside, add, commit and push. Adjust the parameters to your needs. 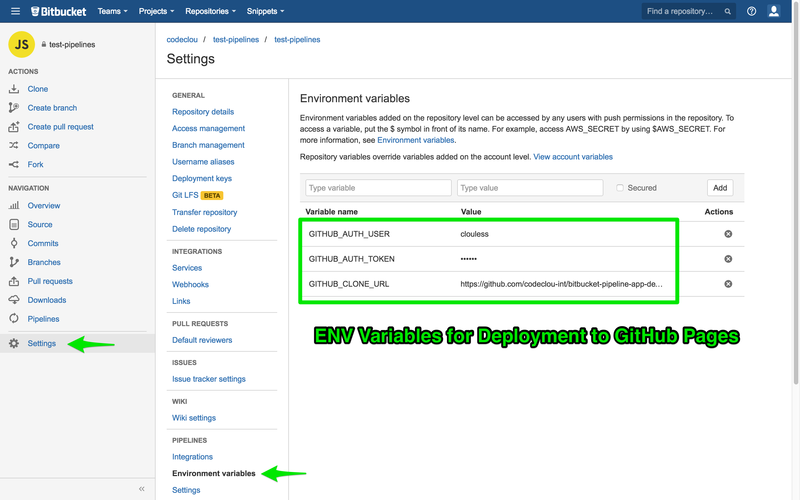 We have already set $GITHUB_AUTH_USER, $GITHUB_AUTH_TOKEN and $GITHUB_CLONE_URL as Bitbucket Pipeline Environment Variables in the previous chapter. The master branch is deployed to the prod subdirectory. The feature-… branches are deployed to the branch-feature-… subdirectory. This command just greps the homepage value from package.json and echos it. You could use that command in conjuntion with a CURL command to send the deployed URL to a Slack or HipChat ChatRoom. 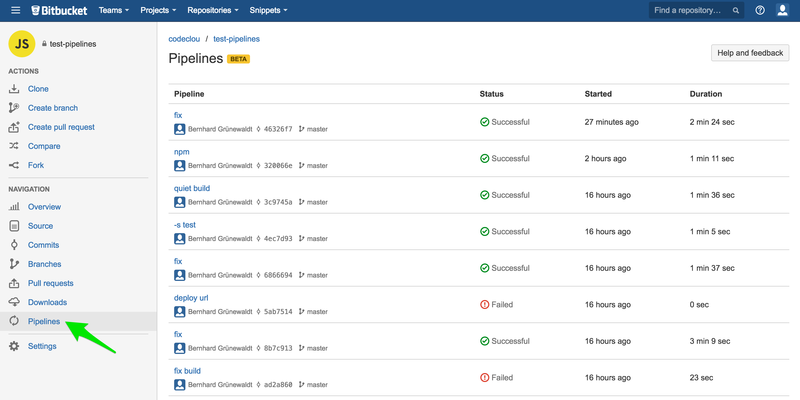 What I like the most about Bitbucket Pipelines is that it’s closely integrated and I don’t have to manually configure jobs and it is automatically in sync with the commits. The ability to handle feature branches differently is a huge plus too. And since it is based on docker you can configure yourself some crazy docker image with all your mocked database stuff or any other tools or scripts and just call them from your bitbucket-pipelines.yml.